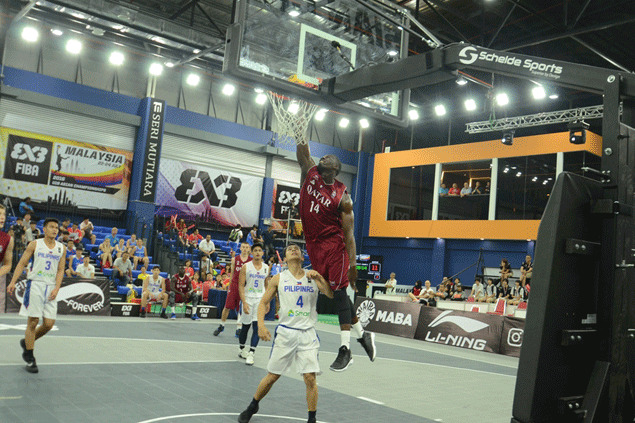 CYBERJAYA, Malaysia – The Philippine team failed to keep in step with Qatar and lost in the final of the FIBA 3x3 U18 Asian Championships Sunday night at the Gem-In shopping mall here. The defending champions proved too much against the Filipinos, 21-9, and ended their campaign undefeated. The lopsided loss was a big letdown for the Filipinos, who came to the gold medal play still in high spirit following their thrilling 21-20 come-from-behind win over host Malaysia in the semifinals behind John Clemente’s clutch game-winning basket. The Qataris on the other hand, cruised to the final with a 21-7 rout of Japan. Despite the runner-up finish in the same tournament ruled by Kobe Paras and Co. three years ago, the Philippines earned a berth in the FIBA 3x3 U18 World Championships next year. Clemente consoled himself after being named in Team of the Tournament along with Qatar’s Alen Hadzibegovic and Malaysia’s Yee Tong Heng, who was named MVP. Other members of the team are Kyle Christian Tan, John Martin Galinato, and Rhayyan Amsali, while coaches are Anton Altamirano and Mark Solano. The women's team of Kristine Cayabyab, Mary Ann Cayabyab, Jenilyn Gamboa, and Cristel Mae Dizon was not as fortunate, after failing to make it to the knockout stage of the distaff side won by Japan.